As Europe’s smallest island nation, Malta doesn’t traditionally get a lot of international tourist attention (though that may be changing!). Though it is regularly overshadowed by the Spanish and Greek islands, and even by Croatia, there is no doubt that Malta has a charm all it’s own. Boasting warm temperatures and sunshine well into autumn, Malta is one of the best fall destinations in Europe–which is why we chose to visit in September! Regardless of what time of year you visit, though, you’re bound to find something to love about Malta. Thinking about planning a trip to Malta? Here’s a quick Malta travel guide to get your plans started. Before you arrive, make sure you know a few things about Malta! We also found credit cards to be widely accepted, and ATMs were easy to locate. You may not want to drink the water. While online sources say that the water is technically safe to drink, we did not like the way it tasted (in fact, we’d say it’s probably to worst tasting water we’ve come across in our travels). We drank it anyway for the first couple of days, but after several locals emphatically told us not to drink it (they seemed a bit horrified that we were drinking it in the first place) and my stomach started to protest a bit, we switched to bottled. They drive on the left. … And not only on the left, they drive in a way that felt quite reckless to us. Malta has an enormous amount of traffic jams considering its size, and watching the cars weave quickly in between lanes and the aggression of the drivers, we were glad we opted not to drive. If you’re planning on renting a car in Malta, be sure to come prepared for a driving experience that will require all of your concentration! Don’t travel to Malta without travel insurance–and that goes double if you’re planning to rent a car! We use and recommend World Nomads for their affordability, ease of purchasing & the clarity of their contract! English is one of the official languages of Malta. The other one is Maltese, though no one expects visitors to speak it. Italian is also widely spoken, especially among the older generation. Malta is a former British colony. 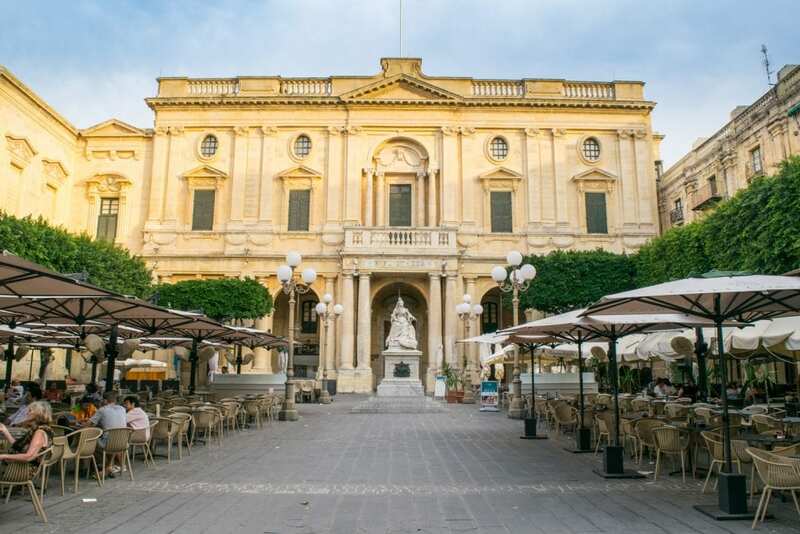 They gained independence in 1964, but as a small island conveniently located between northern Africa and southern Europe, Malta has been visited by (and ruled over) by just about everyone over the centuries, including the Romans and Byzantines. Malta is technically an archipelago. Malta is the name of the country, and also the name of the largest island. 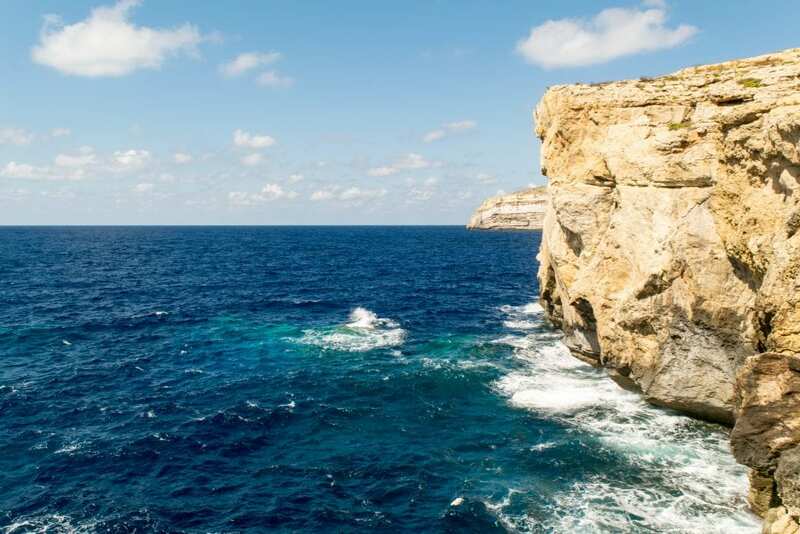 Gozo (home to some villages and sites, and once the famous Azure Window), and Comino (home to three people and the famous Blue Lagoon) are the other two islands that make up the country of Malta. If you’re looking for ideas on what to do in Malta, consider scuba diving, sailing, swimming in the famous Blue Lagoon, visiting the Hagar Qim Temples that date back to 3600 — 3200 BCE, touring the nearby island of Gozo, visiting the famous Blue Grotto caves, strolling through the “silent city” of Mdina, and enjoying the beautiful beaches. Even a full week in Malta won’t cover everything there is to do, but it will be sure to give you an excellent taste of the country. While on Malta, we stayed in the town of Bugibba near St. Paul’s Bay, which is semi-conveniently located for accessing Gozo and Comino (the island that the Blue Lagoon is next to), but not convenient for much else. We enjoyed the neighborhood we were in, but wouldn’t stay there again because it is so far out of the way! If we return to Malta, we will stay in Valletta, which is not only the capital (and home to a central bus station that makes it simple to get everywhere you want to visit in Malta), but was also our favorite city that we saw in Malta–it was home to lovely sites, lots of restaurant options, and, in our totally biased opinion, it was the prettiest! Sliema is very close to Valletta (there’s a short water taxi that goes between them) and is another option worth considering. 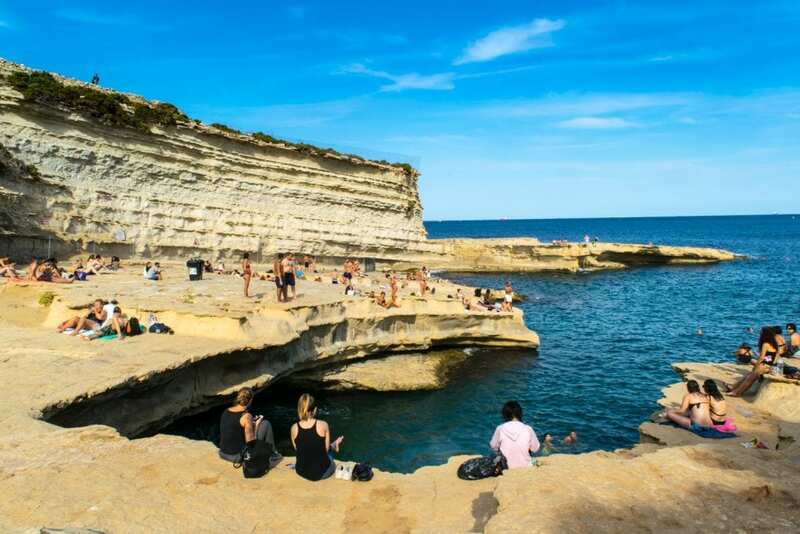 St. Julian’s Bay is near Valletta and Sliema as well, and is popular with travelers looking for nightlife. 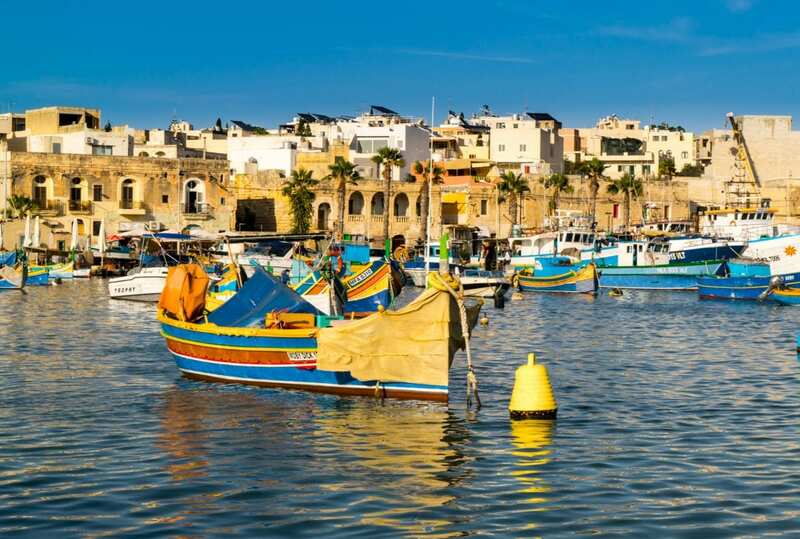 We would not recommend staying in Marsaxlokk–the fishing village is adorable and cute to visit for a day, but is small and remotely placed from the rest of the island. 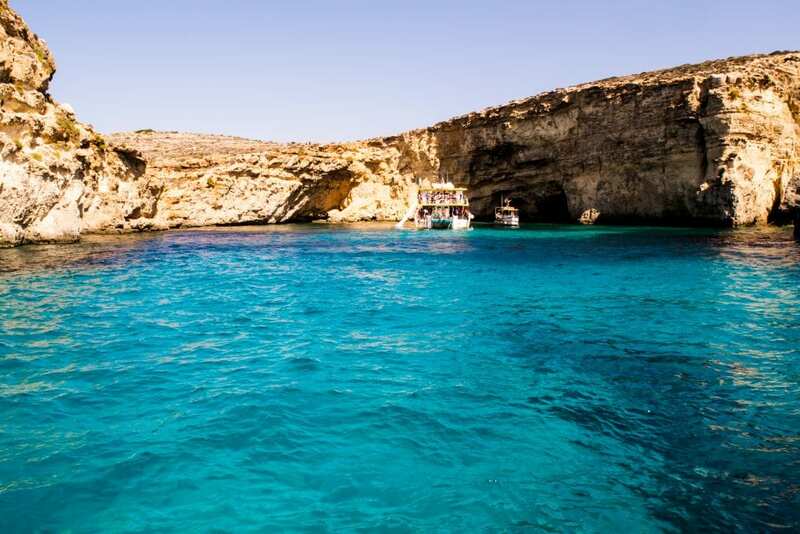 If you’d like a different, quiet experience in Malta, consider staying on the island of Gozo or even Comino (there are only three full-time residents on Comino, and they run a hotel during the summer!). Keep in mind that this plan isn’t for people who want to easily access Malta’s most famous sites. Ready to decide where to stay in Malta? Check Booking.com for great rates around the island! 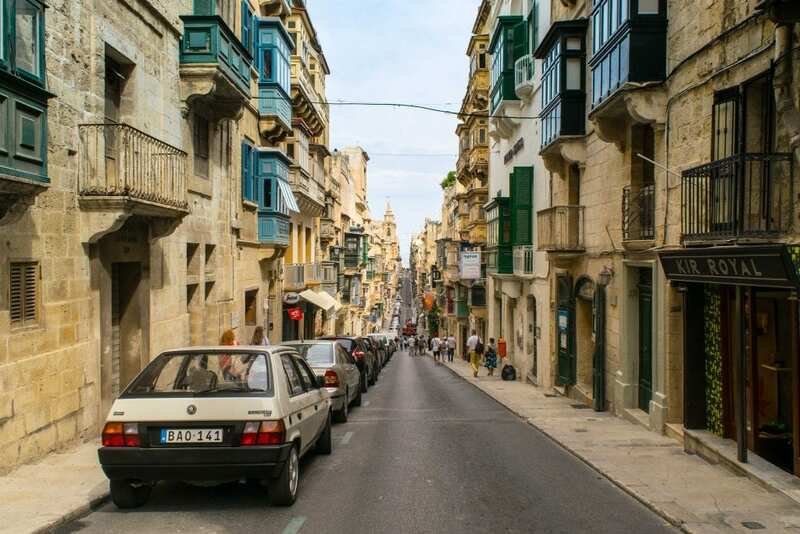 Don’t be fooled by Malta’s small size: no matter where you stay in Malta, you’re going to be faced with some significant time on the road to get between major destinations–often more than an hour each way. Though you can rent a car, we would recommend using Malta’s incredibly extensive bus system to save money, stress, and fossil fuels! The bus will get you virtually anywhere you need to go on the island of Malta. For 21 Euros, you can buy a seven-day unlimited travel pass for Malta’s bus system. Standalone, one-way tickets are 2 Euros in the summer, 1.50 Euros in the winter, and 3.00 Euros for night journeys and express buses. You can check bus schedules and keep up with routes on Malta’s free transportation app, the Tallinja App. We used the app some, but actually found Google Maps to be more useful for getting around Malta. 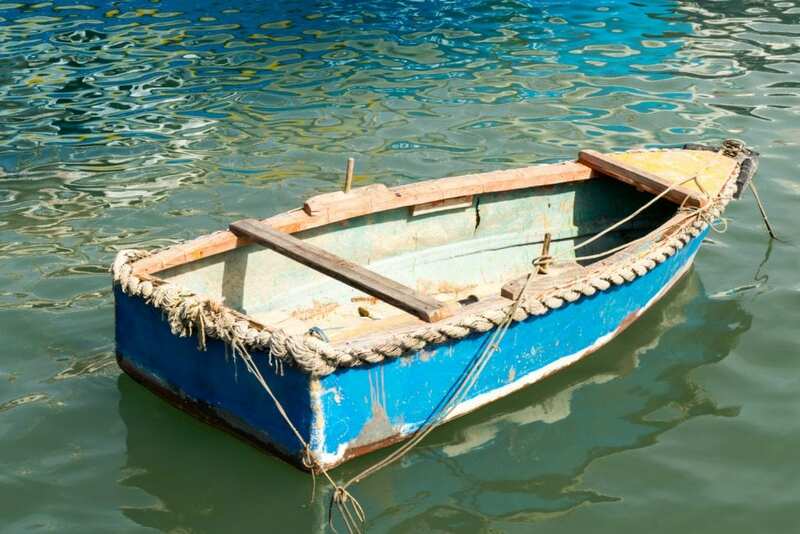 : If you get seasick easily, I can’t recommend these bands enough–they are the reason I was able to enjoy a boat excursion in Malta! : Unlike most of Europe, you’ll need Type G adaptors (aka UK adaptors) for your electronics in Malta. An EU SIM Card: Having access to Google Maps in real time was a must when dealing with managing bus schedules across the island. You can pick these up when you arrive in the country–we used the one we had picked up in Prague. : Like in any beach destination, you’ll pay a premium for sunscreen here–better to come prepared. : We love packing swim goggles for beach destinations: they’re cheap, they’re small and light to pack, and they make swimming (especially if you wear contacts like us) much more fun! Malta may be a small country, but this Mediterranean island nation definitely doesn’t deserve to be overlooked. Plan a trip to Malta and you’ll be rewarded with beautiful views, a chance to learn about some incredible history, and a great excuse for some fun in the sun! Some links in this quick Malta travel guide are affiliate links. If you click through one of these links, we may earn a small commission at no extra cost to you. We are committed to only ever recommending products and services that we personally use and like. Love these tips! I’ve been wanting to visit Malta for quite some time! I had no idea they drive on the left, that’s interesting to note. Looks like a really fun place for a long weekend getaway! Malta hasn’t been on our radar, but your photos are lovely! And good to know that English is one of their national languages and that they use the Euro! Thanks! Malta is definitely in the process of trying to raise its tourism profile–and for good reason, in our opinion! I’d love to visit Malta, especially as I’m in Sicily quite often. Gozo sounds like my kind of place, just the island life. You were brave to drink the tap water there; I always stick to bottled! I had no idea that Malta was technically an archipelago. It’s such a beautiful place and where I’d love to snorkel and scuba dive. I love how rich a history that is in Malta. I’d love to discover it’s hidden stories! I didn’t either! Truthfully, we knew very little about it at all–made for a memorable trip that way, though! Malta and the architecture of the buildings there is simply astonishing. I am definitely adding this awesome travel destination to my bucket list! How many days would be enough to see all the highlights there? The architecture is incredible! I love all the enclosed balconies. I think you could probably see all the highlights in 5-7 days if you move fast… we were there for 5 full days and got through about 70% of them, though we tend to check things off rather slowly these days. The biggest thing is planning out your schedule well to limit transportation time! I LOVE this post!! I have been seeing Malta all over Instagram and have been interested in going but most of this was new to me. They drive on the left side? English is the official language? It’s an archipelago? So interesting!! This made me want to visit even more, so thanks for sharing! It’s officially on my list. Thanks, Christie! Hope you get a chance to go. Malta has definitely been popping up more and more on Instagram et al. this year–it’s easy to see why, it is quite photogenic along the coasts! Bookmarked!!! One of the places I’m dying to visit is Malta. Stunning pictures and I loved it. I am surprised to know the water of Malta is not good to be consumed by an outsider ! Also, it is good to know English is one of the official languages, that saves a lot of stress in communicating. The 21 Euro seven day unlimited travel pass sounds like a budget way to travel within the country! We were, too–it didn’t even occur to us not to drink it at first! A couple of locals we talked to were mildly horrified when they heard we were drinking it. Malta has been making all the right news off late. I love traveling to offbeat places like this one. Despite the small size, there is so much to se/do/eat in Malta. One of my facebook friend lives in Malta. Hope to visit her soon. You shared some really useful tips since not much is known about Malta. It definitely has been! Malta is still a bit offbeat for now, but I’m not sure how long it will stay that way. Hope you get a chance to go! Fantastic tips, everything i needed to know before hand, and now 100% convinced that i have to go! Thank you so much! Thanks, Ericka! Hope you have an amazing trip!